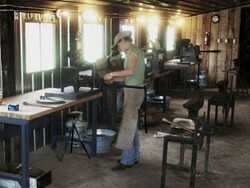 Farrier Craftsmanship and Forging are two more career areas offered at Meredith Manor. While students in our Riding Master and Equine Science Master programs have Farrier courses available to them as electives, we also offer a 12-week Shoeing Short Course and a 36-week Equine Science Master with Farrier Emphasis program - both of which focus on farrier science. With either of these programs, students will start out learning about trimming and balancing the foot along with anatomy of the hoof and limb. 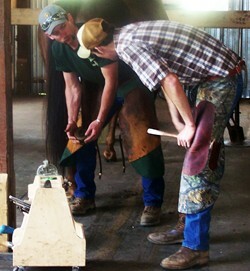 As you continue through the program you get more involved with the shoeing process and how it relates to the horse industry. Our farrier students also have career area electives that allow them to acquire additional skills that can improve their farrier business and provide additional sources of revenue. These include Forging, Training, Massage Therapy, Business Management, and others. When enrolled in the farrier program, you do not need to bring any equipment of your own, the farrier shop is fully equipped and can handle eight horses at a time. 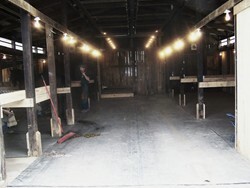 For additional information visit our Farrier School site. Now we will head to the women's dorm which many of our students call home.